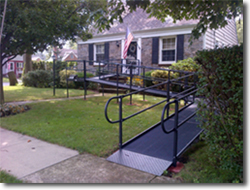 Wheelchair ramps allow us to safely navigate stairs in a wheelchair or on foot. It just makes sense to be safe. Our population is retiring over 10,000 people per day and most have considered the financial aspect of retirement, however, one crucial point that needs to be considered is their safety in the home environment. We call this Aging In Place. The key to aging in place successfully is to take a proactive approach by evaluating your home for fall hazards and prepare with Fall Prevention tools before injuries occur. Our certified aging in place specialist (CAPS) can assist you with this process by a safety evaluation of your property with a broad 124 point survey. Once the survey is done an action plan is developed based on your needs. Ramps For Aging In My Place Mobility Services LLC can help you protect yourself and your loved ones thus enriching the quality of life and enabling you to remain in your home safely. Our focus is on safety for you, as well as for your guests, in and around your home including lighting, trip hazards, and barriers to entrances and exits. Our experience with modular ramps systems may be part of your action plan. Our wheel chair ramp systems were designed with your safety, dignity, and quality of life in mind. 1. Free Estimates and no permits or tax assessments are necessary. 2. Installation of a ramp in your home may be possible within 24 hours. 3. Ramps may be rented for 24 hours or more or purchased for long-term use. 4. Ramps may be removed and reinstalled if you move to a different location. 5. All ramps meet American with Disabilities guidelines and building codes. 6. Ramps can easily be removed from rental properties with little evidence they were on the property, a point landlords appreciate. 7. Ramps are ruggedly built with little maintenance and stand alone with no alterations to your home. If you decide a ramp may be best for you a Ramps for Aging In My Place Mobility Services LLC team member will come to your home to measure and do a site evaluation so a design can be drawn with pricing for your consideration. This is a good time to mention to us if you have any other safety concerns or would like us to perform the safety survey.